I made these yummy wraps for dinner last night! They were a hit! *Place cut up chicken in crock pot with wing sauce on low for 2-4 hours. 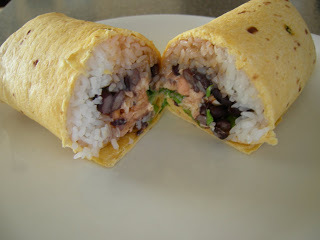 Place chicken, rice, beans, lettuce, and dressing in wrap (amount to your liking)… Roll up and eat! Also good with blue cheese chunks! Great recipe Caroline, would you mind putting it on the Share-Eat-Enjoy blog? Thanks! I tried to find the orange wing sauce but couldn’t find it. Could you tell me where you got it?